The performances by the Finnish Baroque Orchestra are exemplary. Music historians of our time invariably describe the early 18th century as the era of Johann Sebastian Bach. But if one were to have asked German musicians living at the time, they might well have described it as the era of Georg Philipp Telemann. The distinguished music encyclopedia published by Johann Gottfried Walther - J.S. Bach's cousin, as it happens - in 1732 devotes four times more space to the fashionable maestro of Hamburg than to the humble Thomaskantor. Graupner's total surviving output comprises some 2,000 separate works, including ten operas, a hundred symphonies, a thousand cantatas, 85 orchestral suites and 44 concertos. A significant part of his orchestral output consists of concertos and suites with diverse, sometimes very curious instruments in the solo ensembles. Among the rarer solo instruments he favoured were the flûte d'amour, a flute pitched a third lower than the normal transverse flute, and the viola d'amore, an instrument roughly the same size and shape as a viola but with resonating free strings in addition to the (usually) seven strings played with the bow. Combining the traverso and hunting horn in the same concerto, or the viola d'amore and the chalumeau, was extremely exceptional for the period. What is significant in Graupner's music is his exceptional command of melody and harmony, which do not really resemble those of any of his contemporaries. 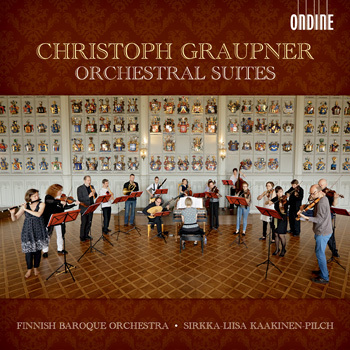 A second volume featuring Graupner's chamber music will be released in autumn 2014.